Offering free massages to marathon runners during last Friday's race, Leonardo Hotel mistakenly turns its Synagogue into a massage parlor. 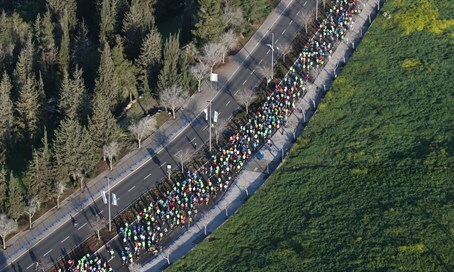 Marathon Runners who recently competed in the Tiberias 42.2 Kilometer Marathon run, were treated to a special type of reward at the end of their long journey. The Leonardo Hotel in the host city of the marathon provided free massages for runners who participated in the race, in the Synagogue at their hotel. Channel 10 published photographs of the impromptu massage room, that depicted massage tables set up in in front of and in close proximity to the Holy Ark, as well as in other corners of the room. The runners, who were wearing sportswear and running clothes, were treated by masseuses who were specially brought in for the event. Chief Rabbi David Lau responded to the incident with outrage. “A synagogue is a holy and sanctified place for each and every Jew. These pictures are a shot to the heart for every Jew,” he stated. Sources close to the Chief Rabbi have said that Lau intends to look into the matter and question those involved in the decision to host the massage parlor in the synagogue, as to why it was allowed to happen. “More education regarding the how to treat a holy place with sensitivity is needed,” said the Chief Rabbi.